NDP Leader Tom Mulcair says his party will move to send the government's proposed election law reforms to committee before the first vote in the House of Commons, accusing the Conservatives of being "serial cheaters" with ulterior motives. Mulcair said if the bill is true to its name — the Fair Elections Act — then the government should accept the party's offer to have experts look at the bill and testify in front of committee along with Canadians. But, he said, if "this is mostly about making life easier for the Conservatives, who are serial cheaters in federal general elections," then he expects the government to limit debate in the House and rush through the proposed law. "I am quite concerned that this is the first offering of a government and a party, again, with a track record — proven — of constantly cheating in elections," Mulcair said. The Fair Elections Act, a 247-page bill tabled Tuesday, is being debated today in the House of Commons. Mulcair spoke to reporters following the final meeting with his caucus before the government's Feb. 11 budget. At an earlier news conference the NDP outlined items that it would like to see in next Tuesday's budget, including a cap on ATM banking fees, the restoration of the ecoENERGY home retrofit program, a curb on credit card fees and an end to the practice of companies charging consumers for receiving paper bills. Mulcair said an exemption for some fundraising costs, which would let parties spend freely rather than counting the cost of contacting previous donors under their election spending cap, is just one of the measures in the bill that will "favour the Conservatives." The Conservative Party has been collecting and keeping detailed information on their donors and voters for years, a system to which the NDP and Liberals are scrambling to catch up. 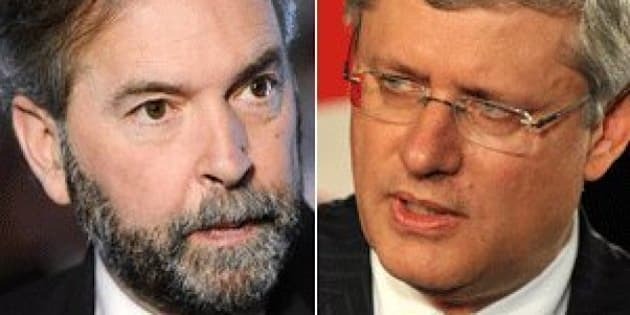 "They're tipping the scales a little bit in their favour," Mulcair said. The NDP leader pointed to a provision to eliminate vouching, a process that sees someone at the polling station swear that someone without identification or a voter ID card is who they claim to be, and eligible to cast a ballot at that polling station. The bill would also eliminate voter ID cards as a method of identification, requiring government ID to cast a ballot. Mulcair says the vouching change will affect 100,000 people. "A fairer election is an election in which more Canadians participate... Who are those people who are being affected? Whose vote are we suppressing here? Young people, First Nations, people who are at the bottom of the ladder, often, socioeconomically," he said. "Instead of making sure that more Canadians participate in the next election, Conservatives are actually making it more difficult. So we have a lot of problems with some of the things that are being proposed here."